With living spaces getting smaller and families getting bigger, the demand for collapsible, foldable, and extendible tables is ever-increasing. 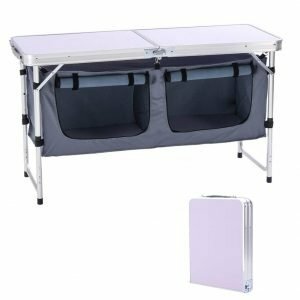 Collapsible tables have an immensely dynamic function- not only do they take up less space, but they are also portable and can be carried around for all those picnics, barbeques, and road-trips that we love to go on. While everyone has their own set of requirements for foldable tables, some tables stand out from others. In this list, you’ll also find small table for dinning and for kids. A sturdy table that seats 4-6 people, the SpaceMaster Dining Room is ideal for those who love small spaces but do not wish to compromise on quality or elegance. With a walnut wood finish and an adjustable X to easily collapse the table, SpaceMaster has ticked all the boxes for a multi-purpose, sturdy, and space-saving collapsible dining table. If you are looking for something more budget-friendly, the Corell R-series is the place to look. With a strong steel frame but a light plastic top, the R60 is ideal for something that is sturdy yet portable. The table can easily seat around four people and has a 30 -inch diameter. While it may not be the most elegant to view, it certainty does the job. Retailing for about $80, it doesn’t get more economical than the Lifetime 22301. With a 37-inch top and a beautiful almond finish, the collapsible table is ideal for a picnic with kids. It boasts a durable and strong outlook and a rust-resistant all-weather frame, which along with its lightweight properties and portability make it a great option for those on a budget. A foldable, full-size folding table large enough to seat 4-people, the Coleman $80 table is great to carry for long trips due to its lightweight. With its aluminum setup, it is easy to hold and carry and does not add on weight. 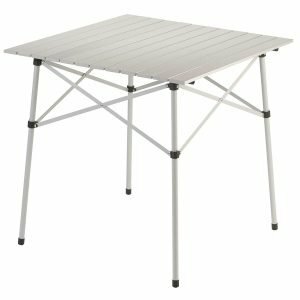 It is also quite elegant, the aluminum finish gives it a unique outlook and its checked top has a marked personality, making the Coleman Folding Table a great addition to your camping gear. 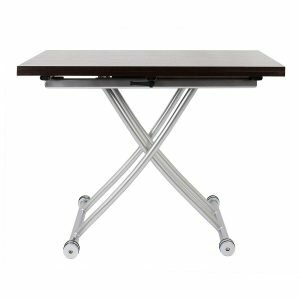 Overall, the Office Star Folding Table is perhaps the most complete and multi-purpose option you will find on the market. With its ability to hold about 300 pounds of weight, a heavy-duty frame that is water and stain-proof, and a simple yet attractive outlook, the Resin folding table is ideal for those who wish to use their table for various purposes. Build for both indoor and outdoor use, the table is 6-feet long and can seat about 4-5 people. 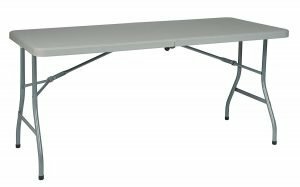 With the ability to fold flat, a durable-steel frame, a powder-coated finish, cross-braces, and a vinyl exterior, the 20”x48” Costco folding table is portability-extreme. The cheapest table on this list, clocking in at about $40, the Costco top can seat 2-3 people. While it may not be large enough for a party, it gets the job done if you really want to save money. For those looking for quality yet not so pricey, we have the ingenious IKEA Ingatorp Desk. The dual folding drop-leaves makes it easy to adjust the table size according to your needs. It is one of the most stylish pieces of foldable furniture out there. The unique design and elegant outlook will give your small room both quality or portability. The Scalloped Edge Wood Folding Card Table is designed especially for small apartments and is a stylish piece of contemporary design. It has a white, marble-like outlook that fits in with any contemporary interior decoration. With a clean yet simple aesthetic, the Scalloped Edge Wood Folding Card Table is easy handle and fold but looks great and extremely stylish. With a secure lock and all-seasons top, the $50 Deluxe 6-foot Centerfold Table is lightweight yet incredibly attractive. It has a comfortable handle and weights only 25 pounds yet is large enough to seat about 4-6 people with ease. Its all-seasons frame is also ideal for outdoor use- say goodbye to rust and wear! The BT3000 with its unique rectangular steel frame and a molded plastic top is the last to make it to our list. It is slightly pricier at about $100 dollars, but the price is definitely worth it. With a 6-foot frame and sturdy legs, the table is ideal for 6-7 people and a lot of food. It’s fully white exterior also looks simple, and so it will blend in easily with all other pieces of furniture. 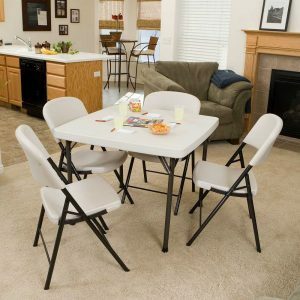 Small portable folding tables are convenient and easy to set up and move. They can be used for many purposes, from small household tables for households with only one or two people as their main table, or used for outdoor and recreational purposes such as camping as is usually the case. This is a list of the best small folding tables to help you make an informed decision. This is one of the best portable folding tables you can buy. It can carry a maximum load of 220 pounds, and is made of top quality HDPE, and it is foldable in half. 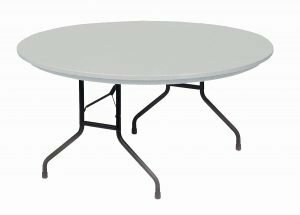 With a size of 18.5 x 27.36 inches, this is one of the best outdoor tables for recreational use and those parties, it will handle plenty of heavy bottles and plates and is easy to clean. This is a good all-rounder small outdoor table, with a size of 120 x 60 x 54-70 cm with an adjustable height. This is good value for money and will work for most uses. It does not however handle as much weight as the Todeco table; it is rated for 65 lbs versus 220. This is one of the best looking small outdoor folding tables, being made of eucalyptus. It folds nicely. It is a bit more expensive than other small folding outdoor tables, but is well worth the money for its looks! This is one of the best tables on the market, and it is sold in different sizes. It is easy to clean and is perfectly functional. The Banqueting folding table is made of plywood with a light oak finish with metal legs. It has a 120 cm diameter and is beautiful and is of good quality. This is a good small portable folding table for those who prefer a perfect square table. It is very durable and it complies with EN581 standards, is UV resistant and comes with a 5-year guarantee. This is a good quality and very small folding table, measuring at 60 x 40 x 27 cm. It is made of robust aluminium and has a very solid look. This table was designed with strength and is also easy to carry, and is available at very good prices. This is a good quality budget folding table that is very light, measuring at 25.5″ x 19.75″. It is designed to easily be moved and is good for indoor use. This is another outsunny table but with carry handles. It weighs only 2.7 kg and is easy to carry. This is designed with the traveller in mind, and is great for camping trips and festivals. This is probably one of the smallest tables available here, and it weights around 1.7kg. This is aimed at camping and is just big enough for a two-man camping trip. The above small folding tables are all good choices, and they can be used for many purposes. From camping to recreation. We hope this has been an informative guide and has helped you chose the right table for you. Giving children their very own notable table is fundamental to finding the center. Some plastic sets can be used all around, however, when all is said, those at the temperate end are all the more meaningless in quality. The yield for materials that are effectively cleaned will withstand scratches and pounding and will withstand high stress over a short period of time. While all of the collapsible tables listed here are great in their own right, the choice you make really depends on your own requirements. If you are looking for something economical, we recommend the plastic tops but if you are going for high aesthetic value, think about the F2 or the Ola!